I just came home from a great day of racing on the bay. In the past few races I have been responsible for trimming the jib. Jib trimming seems to be the position which requires the greatest strength on the boat and the first couple of times I was clearly weak. Subsequently, I have, therefore, been doing some kettlebell rowing(*) in the backyard with my 70 pounders and that really helped. All tacks and gybes today were good, one was perfect (right into a great trim) and one required some grinding. I think to someone with my kind of personality, there is practically nothing better than to learn a subject, master it, and then execute it. (*) You take two KBs and put your hands on the handles and form a plank/push up position. The KBs are then lifted alternately to the hip. Actually, there may be only one thing better, namely reaching the state of mushin, which I discussed to some degree in this post. In that regard I have been reading a lot of books lately (possibly the explanation of the sparsity of posts recently) on this concept. This book describes mushin particularly well. The “Way” to mushin may be from perfecting specific “ways” by repeating them over and over—training them into the mind so the mind becomes one with nature, maybe? I am trying to understand this better and so I am currently reading this book. I note that the Western World’s focus on productivity and stuff is rather poor in that regard. For example, I usually drink instant coffee, because it is easy and presumably productive. The Japanese have a tea ceremony. I can’t really say I have a coffee ceremony as such but I have started brewing my own coffee. You start with some green beans. They are kind of hard to get but you can buy them in bulk for $3–4 on the internet. 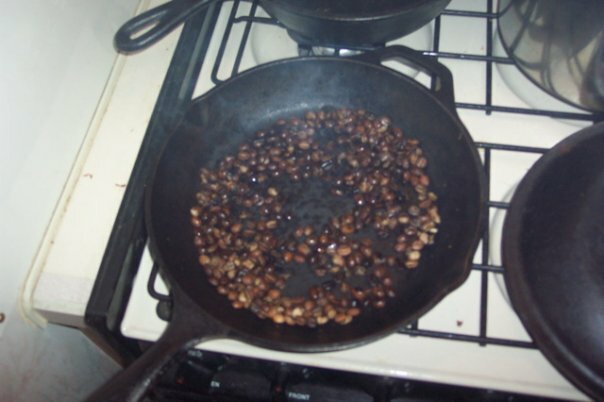 You then roast them for 6-7 minutes much like popping popcorn. Keep the lid on and monitor the color (yes, that’s tricky with a cast iron lid! 😉 ). As you can see what I have here is more like an index roast than the dark-brown I was aiming for. Clearly I need to work on my technique. Immediately after roasting, I put them into a colander and shook them to get the chaff off and prevent them from further roasting from their internal heat. Pouring them back and forth between a bowl and the colander would have been more effective. The wind would have borne the chaff away, much like how you do it when threshing wheat. Here you see the grinder, my improvised filter holder (a rubber band) and my Einstein coffee cup. I would say, my first cup of home brew was drinkable. Maybe a little bit better than the instant coffee (fresh makes a big difference). It was not very productive though; it took at least half an hour. Then again, would it have been better to have spent half an hour at a job to earn money to buy a cup of coffee at starbucks or a new grinder/coffee machine at the mall. Only you know your answer to that one. After reading the comments, I brought out the meat thermometer and aimed for 195F (90.6C) water (using 10 and 20 second bursts in the microwave) and tried it out on a new and darker roast (more uniform this time thanks to lots of shaking). I also found a better way to arrange the filter (taller cup). And I just gotta say … Wow! This is as good as or better than what you pay $$$ for in stores. 22 users responded in " Sailing, coffee brewing, and The Way "
Check out aypsite.org – it’s the best I’ve ever read on the cultivation of enlightenment. Although it is a website about yoga, I think that the state of “mushin” has many different names depending on the context, whether it’s religion or combat. On aypsite.org it’s called stillness in action. I like it because of its systematic approach to “exercising” the natural ability of humans to enter that state. It leaves behind all the mythology and goes straight to the human nervous system – choose any belief system to go around it, it still works because you have a human nervous system. The methods there could be adapted to swordsmanship (or any other path) once a basic proficiency is gained. Very envious of your sailing adventures. You probably know much more about sailing than I do by now. They say you should let the sail out until it just begins to flutter, then tighten it up a bit. Is that how you are doing it? Do you have tell-tales on your jib that tell you when the flow becomes separated? Or are you simply following orders at this point? Just curious Jacob, but do you percolate your coffee or boil it? Never mind, judging by the picture I’m guessing you boil (or steep?) it since you are using a filter on your coffee mug. @Jeff – It would not surprise me at all that everybody is pursuing the same underlying phenomena from different directions. Going at it from a more sciency direction is certainly appealing to me. @MoneyEnergy – I wouldn’t put it in exactly those words (yet), but yes, I am aiming to increase flexibility and adaptability to deal with things like peak oil, first and foremost. @AlexK – “When in doubt let it out” 🙂 On the jib, we have telltales on both sides. The jib is like an airplane wing (if we are on a beam or a broad reach we always run the spinnaker) so the angle of attack is what matters. To wit, if the telltales on the leeward side are fluttering (straight up usually) indicating a detached flow it means that the AOA is too large (an airplane wing would be going too much upward without enough speed) and the sail is stalling and so the sail is eased out. If the AOA is too small, the sail acts more like a flag (and it flutters); here the windward telltales would flutter indicating a turbulent flow on the windward side and so the sail is trimmed in to increase the AOA. This means that as the boat speed increases the wind comes more from the forward direction and so you trim it in. You want the sail to be right next to stalling without actually being stalled. That’s where maximum lift is generated; like an airplane. (At least this is as far as I understand it.) Of course the helmsman can change the AOA relative to the wind just be changing course and that is how you would do it if you were cruising since it is less work. In racing, the helmsman sets the course and the sails are trimmed to that. On the J/105 we also have rails on either side that determines where the clew line is being pulled from. If we set it forward, trimming will pull the jib down which is good for light air to flatten the sails but restricts the control over AOA. For heavy air, it can be set further back to control AOA. In terms of knowledge, I’d say I know a little about mainsail and jib trimming and how to make the boat go 0.1 kn faster, but little about most of the other stuff, especially docking operations under power, or in particular anchoring. Also, I am still clueless about tactics. @George – I manually drip water on top of the grounds in the filter. I don’t sail, but I cross country ski which kind of reminds me of the process of sailing as you describe it: comprehending a complex physical activity and then working towards it until your body can do it intuitively. I like anything that combines athletic ability, intellect, concentration and being outside! As for the coffee, mastering the art of roasting your own beans sounds fun–and I love the smell of coffee! I’ve tried the system of making coffee through a cloth (I actually draped mine inside of a colander and placed it over my coffee). But my coffee was not so good. I prefer the ‘French press’ (which the French call the ‘presse italienne.’ I bet that if you wanted to, you could build one quite easily or get one free or cheap. @Simple in France – My method of roasting is the simplest possible I can think off. Apparently better roasters use a hot air stream. Maybe a metal netting over open flame works too. The challenge is to make a uniform roast. As you can see I was far from achieving this. In terms of choice, you might end up with less, actually, when going for green beans. I’ve noted that the closer you get to the source, the harder it is to get stuff … remove all the opportunities for profit and nobody is willing to supply. I have the same problem sourcing washing soda. As for the roasting method, it seems pretty good, but possibly in an oven-type situation would give you a more uniform roast . . .Well, if I have a chance to play with it, I’ll let you know! I’ve read that putting the green beans in a air popper is a great way to roast coffee. I’d be interested to see your results with this method. Many of the old timers would not allow their coffee making equipment to ever be washed, including their mugs. I don’t hold to this as I have found that the coffee oils tend to turn sour when the pot and mugs are reused with a washing. Some will only rinse their mugs and turn them upside down. I fully agree that going to a coffee shop daily is way out of line in cost. I can make the same or better (to my taste) coffee right at home. My wife likes the chilled and exotic coffees so we just get the ingrediants for that and again make it right at home. @es – Yup, but I don’t have one of those, so what I’ll do in the future (to see if it makes a difference) is to sort the beans according to roast by hand. While I haven’t dived into roasting my own beans, I highly recommend getting a French Press (aka a Press Pot). Brand new they’re under $20, but they can easily be obtained second-hand for a few dollars. Unless you break one (they’re glass, after all), it should last for many thousands of pots of coffee. 2) 195C water (measured with a thermometer to be precise). 3) 4 minutes exactly in the French Press. I am consistently able to get better coffee from this method than anything at Starbucks or other coffee shops, and unlike traditional coffee makers, there are no electronics involved to break down and keep me from a good cup of bliss. @George – I used to have an occasional cup of French pressed coffee at my work and I did not like it as much as drip or even instant. It was very gritty. We didn’t use thermometers and stop watches though. Did you mean 195F? Do you bring it to a boil and then let it cool down or do you never let it boil? I’ll stick to my Krogers brand in a can. big break through in brewing coffee. Hotter and too much acid is leached out:bitter coffee. colder and blah coffee. Tip courtesy of the starbucks brochure included with the only pound of Starbucks I ever bought. Also, use a tea strainer to separate grounds from brewed coffee. save price of filters or a french press. Another often used method for home roasting is an old garage-sale hot air popcorn popper. You can roast a batch pretty evenly as you watch. The chaff normally blows out during the roasting. Do you bake your own bread as well? 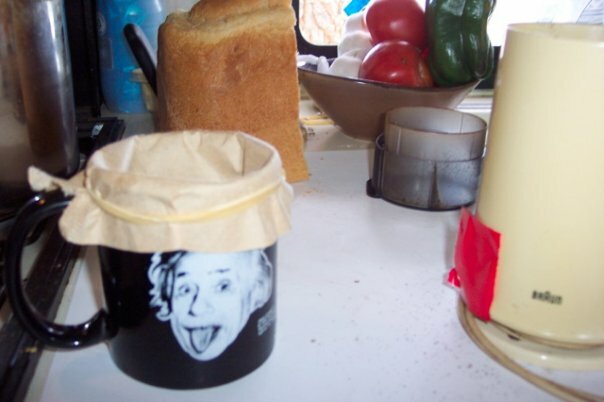 Looks homemade behind the Einstein cup. In the Bay Area, there are roasted coffee from Peets or (less expensive) organic free trade roasted coffee from Trader Joe’s that are really, really good! I’m a coffee snob and can make my own (drip) easily from freshly roasted beans. Much better than any but the better shops (Blue Bottle). Starbucks coffee is substandard, although if necessary, I can make decent coffee at home from a bag of their roasted beans. I prefer to support non-chain stores, but have not found that Peets’ quality has suffered now that it has expanded. The original one is still on Vine in Berkeley, and the second one was in Menlo Park (still there). If i have only one KB would I be able to do the exercise you mentioned? @Dave – Yes, that bread is homemade. @PC – Do one arm at a time. Support the other hand on something semi-sturdy (or fully sturdy) of about equal height. For me the most economical is the stainless steel pots by bialetti. Works on gas, electric, campfire. Or any heat source. My first one cost about 30 euro whilst backpacking, camping and lasted over 15 years, which equates to over 5000 cups. About .005 euro per cup. Low effort, quick, unbreakable. Combined with a good, cheap Coffee, instant or shop bought can’t compete.